Do you need a reason to Visit North Dakota? North Dakota offers ample outdoor activities, a scenic views, abundant history and stellar roadside attractions. When my husband and I drove across the country two years ago, North Dakota was on our list of places to see. Unfortunately, we ran out of time and had to cut a few things from our itinerary. North Dakota, Minnesota and Wisconsin were those few things. While I was disappointed at the time, that decision worked in our favor because when we finally did make it back to see those three states, we had more time to spend in each. My husband and I were invited to explore North Dakota and had the opportunity to sight see across the state. Today, I’m sharing a rundown of our experience with more posts to follow that go a bit more indepth of the various attractions. We left Ohio as Labor Day Weekend drew near. 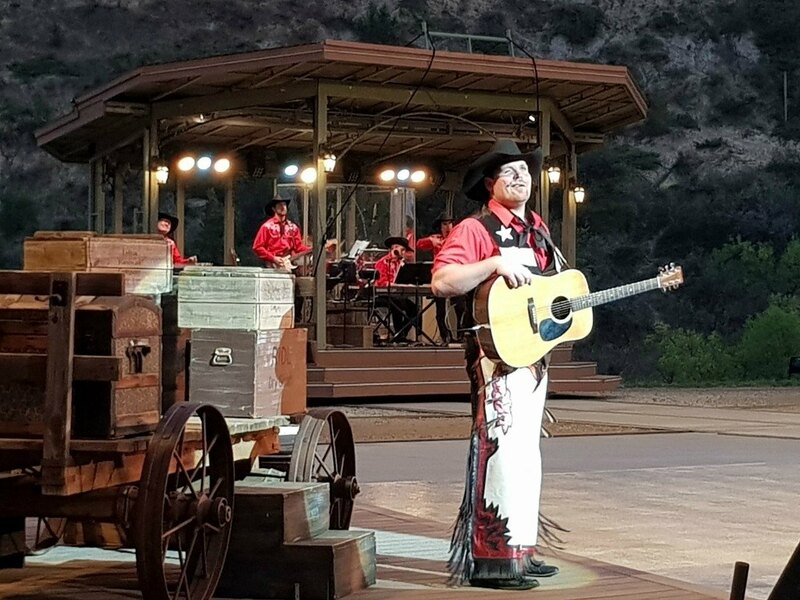 Our first stop was to Medora in the southwestern part of the state to see the Medora Musical which would be closing for the season the following weekend. While we had only planned to spend one night in the area, it’s clear that we should have arranged for several. 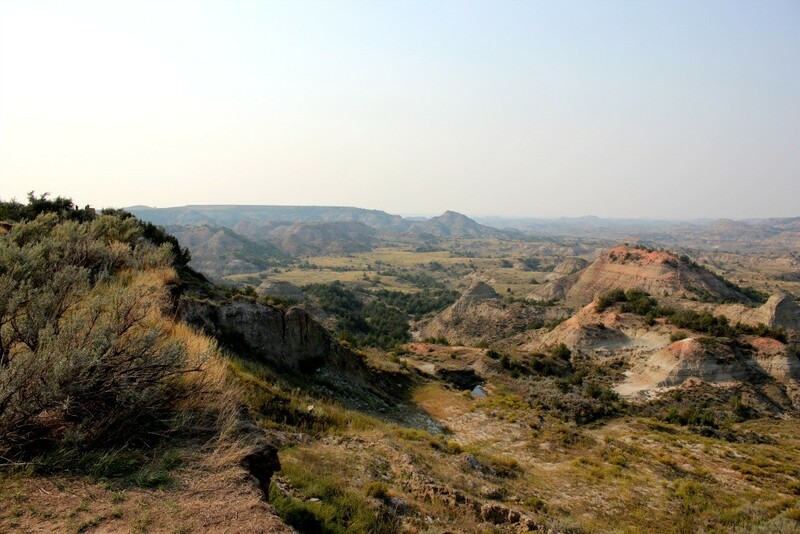 Set in the shadow of the Badlands, Medora is historic and charming, the epitome of what I imagined a western town to be. 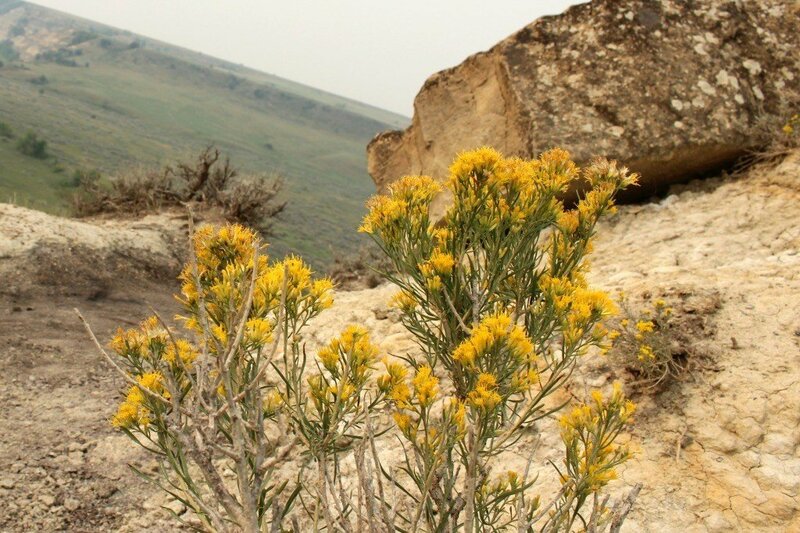 It’s that “Old West” feel that draws thousands to visit the area each year, and of course it doesn’t hurt that Medora is surrounded by Theodore Roosevelt National Park. The North Dakota Badlands were named for the 26th President, recognizing his contribution and legislature to protect our national resources. This park now tops my list of favorite national parks due to the abundant wildlife viewings we experienced. 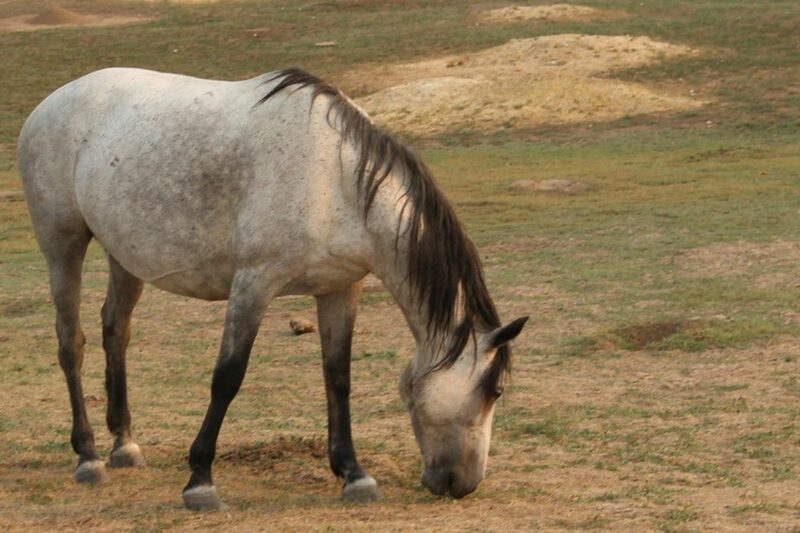 We spotted plenty of bison, prairie dogs and wild horses and the scenic views are unparalleled. 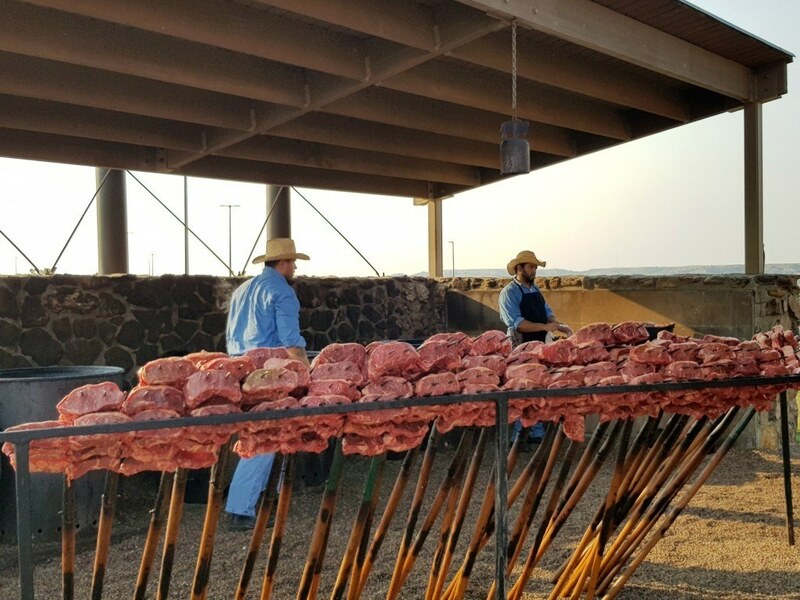 Another highlight in Medora was dining at the open-air Pitchfork Steak Fondue. Admit it, the thought of eating a steak grilled on a pitchfork is too tempting to resist! Well, it may not be for you, but it was for me and my husband. After dinner, we relaxed taking in the view of the sun setting on the landscape as we waited for the Medora Musical to begin in the Burning Hills Amphitheatre. The musical has welcomed visitors since 1965. Each year, the revue is updated so the show differs from year to year. We spent our first night in North Dakota at the AmericInn in Dickinson. The budget friendly property offered comfortable rooms and a lobby reminiscent of a mountain lodge. Exhausted from our long drive west from Ohio, we slept in the next morning and missed breakfast, but on the way out, I did notice an AmericInn guide to weird things across the US. Be still my heart- they certainly know how to get my attention! You may be curious as to WHAT drew me to North Dakota in the first place? Believe it or not, it was the Enchanted Highway, a 32-mile stretch of highway that boasts some of the world’s largest scrap metal sculptures. How could I not get excited about an entire highway full of roadside attractions? I’ll share more about this in another post, but I will tell you that I had an opportunity to meet Gary Greff, the artist who designed the sculptures that are located between Gladstone and Regent and for this roadside attraction lover, meeting him was like meeting a Rockstar! The Enchanted Highway ends in Regent where you can dine at the Enchanted Castle. Unfortunately, due to us running behind on our schedule, we missed lunch. But that doesn’t mean that I wouldn’t welcome an opportunity to return to dine and stay at the castle! From Regent, we backtracked along I-94 to see Salem Sue, up close and personal. 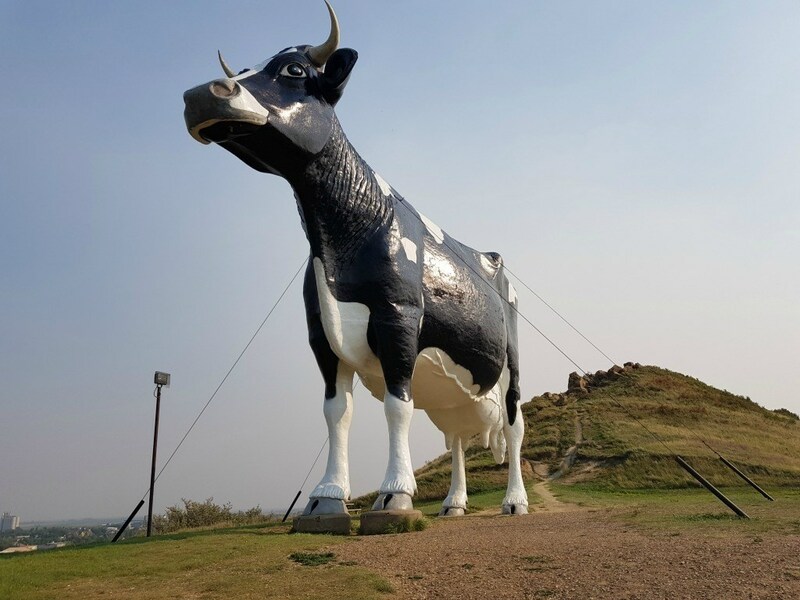 The World’s Largest Holstein Cow, Salem Sue has stood in New Salem since the 1970’s. She’s visible from the highway, but head my advice and take a minute to grab a selfie with the cow and stretch your legs. There is even a picnic table, so you can dine in the shadow of her udders for those who plan ahead. We spent the next night in the capital city of North Dakota at a Main Stay Suites in Bismarck. Our room was amazing and though the full kitchen made me want to cook- I resisted the urge and we ordered a pizza from a local pizza place. Our pizza was delicious, and I wish I could remember where we ordered it from. We slept in a bit the next morning and while I was on a business call, my husband headed out to the continental breakfast in the lobby. Again, we caught breakfast right at the tail end so there wasn’t much left but we did have left over pizza to munch on. I was disappointed to miss the Lewis and Clark Riverboat and the historical attractions in town, but I would not leave the area without taking a stroll down Art Alley. My husband wasn’t as interested as I was but I had to view every single mural on in the alley at least twice. Art Alley is simply an alley in Bismarck that the community has turned into a showcase for area artists. Their work is incredible, and I had to remind myself that my husband was waiting in the vehicle for me or I would have lingered much longer. 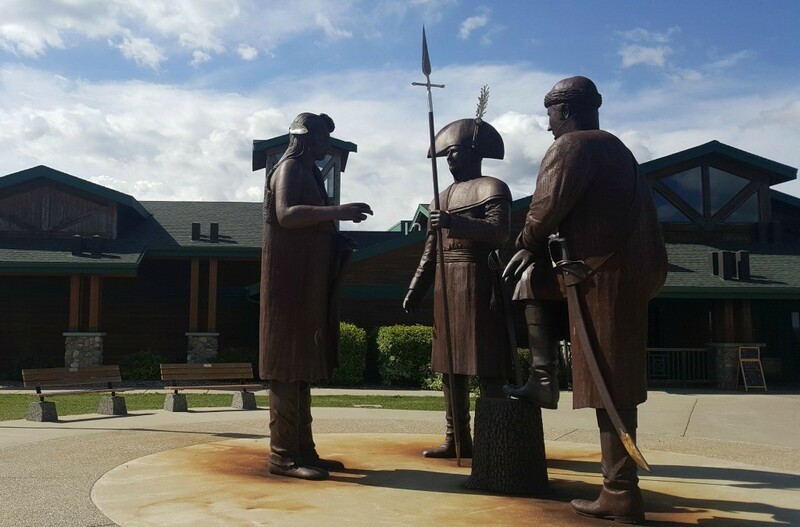 We stopped at the Lewis and Clark Interpretive Center on our way to Minot and viewed the galleries. While my husband read about the small pox epidemic among the Indians, I strolled the gallery admiring the art work (are you beginning to see a pattern here)? While we originally planned to also stop at Fort Mandan, which is only a mile or so down the road, due to our late morning, we pressed on. 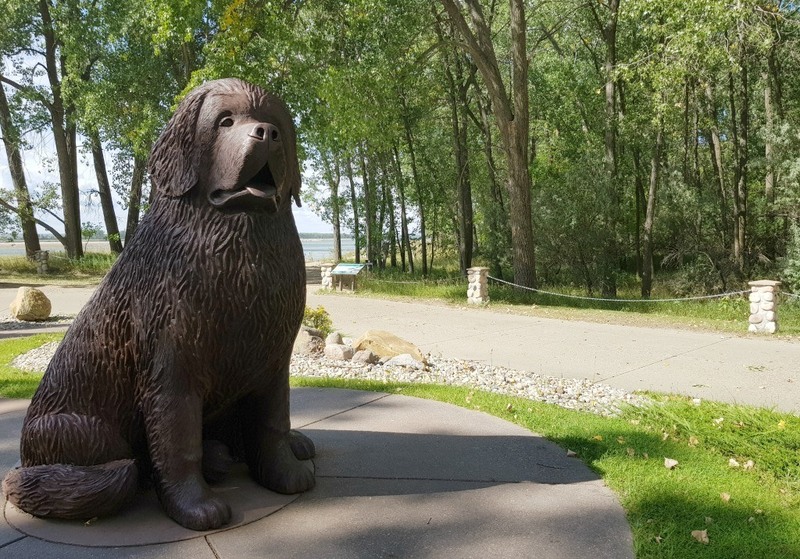 But not without convincing my husband that I needed to snap a photo of Seaman, the famous Newfoundland dog of Lewis and Clark that stands along the shore of the Missouri River. 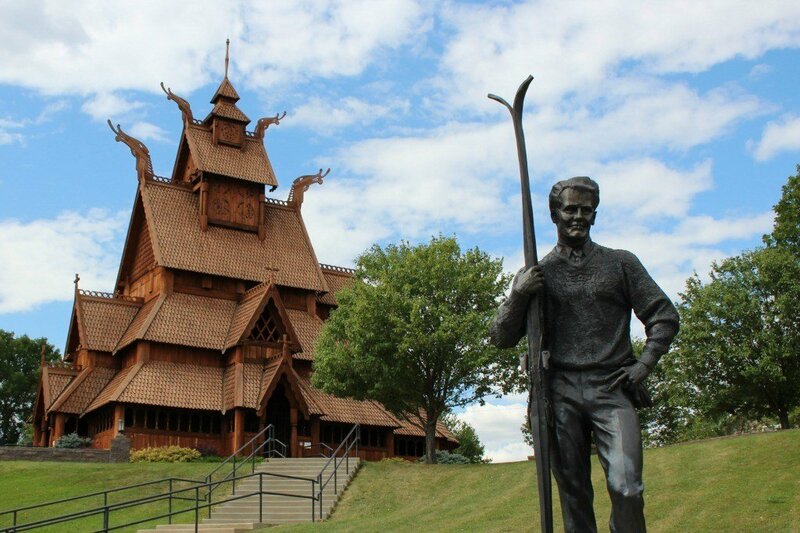 Passing through Minot, we stopped at the Scandinavian Heritage Park which features replicas from each of the five Scandinavian countries: Sweden, Norway, Denmark, Finland and Iceland. We saw a 25-foot-tall Swedish Dala Horse, real grass roof Stabbur, and a replica Stave Church. They church was beautiful and we had hoped to get a glimpse of the inside. Unfortunately, all the buildings on the property were closed during our visit. 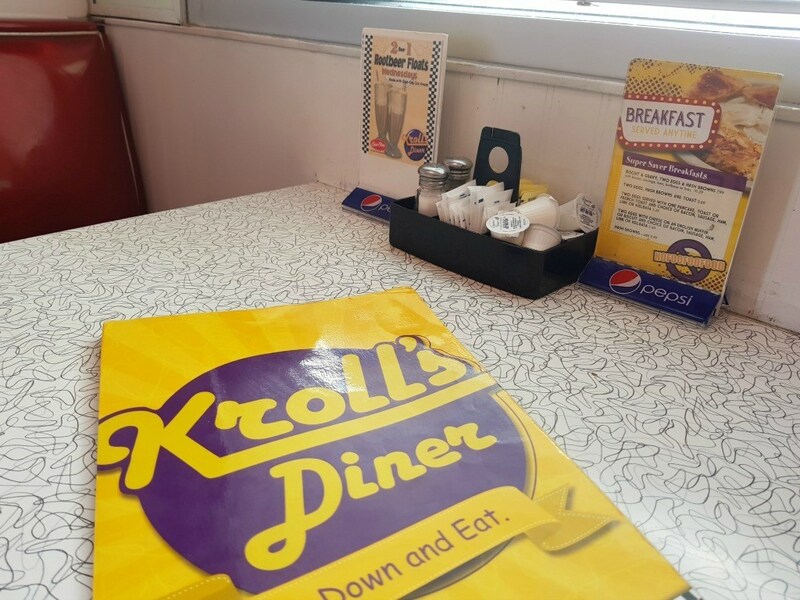 We stopped for lunch at Kroll’s Diner, which was a fun stop. Though it’s a chain restaurant, it offers an authentic diner feel with good service, good food and large portions. Enough that we didn’t eat the rest of the day. We continued toward Bottineau and I marveled at the changing landscape. No longer brown and dusty, looking out the car window, the passing landscape had become green and lush with gently rolling hills. We were headed to the Pride Dairy which has been named the best ice cream in North Dakota and my husband was ready for a root beer float. But it was here that we learned a lesson. The downside to visiting North Dakota (or anywhere) on a holiday weekend is that many of the attractions we had hoped to see, observed holiday hours or were closed completely. And much to my husband’s disappointment, that included Pride Dairy. We looked for another ice cream place in town but the local DQ was closed as well. To console ourselves, we drove to Tommy the Turtle. 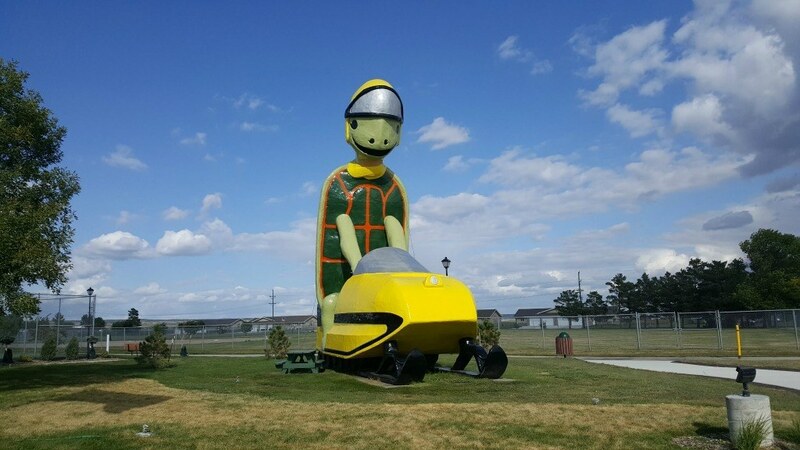 Tommy is the world’s largest snowmobile riding turtle. Now I’m curious as to how many snowmobile riding turtles exist in the world- my research has uncovered two so far. Tommy cheered me up, but did little for my husband so we continued to our next stop, the International Peace Garden. The garden was established to celebrate the peace between Canada and the United States for more than 200 years. 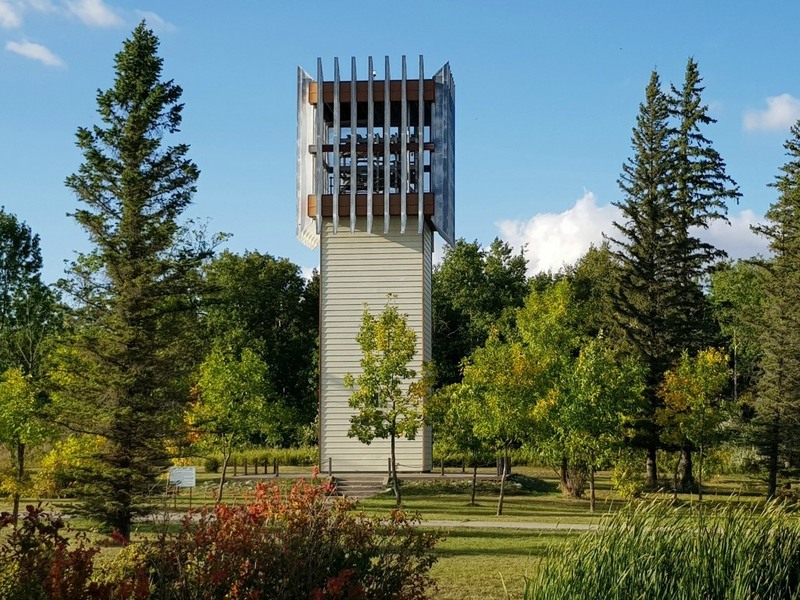 Highlights at the International Peace Garden include the Carillon Bell Tower, the Peace Chapel, the Clock and the 9/11 Memorial. Originally, this stop was not on my list but my husband and I have been reading a devotional together that mentioned the attraction and we knew we had to go. We were not disappointed. We even considered van camping at the International Peace Garden, but we had gotten a bit behind on our schedule and wanted to catch so we continued to Rugby which had a few surprises of its own. 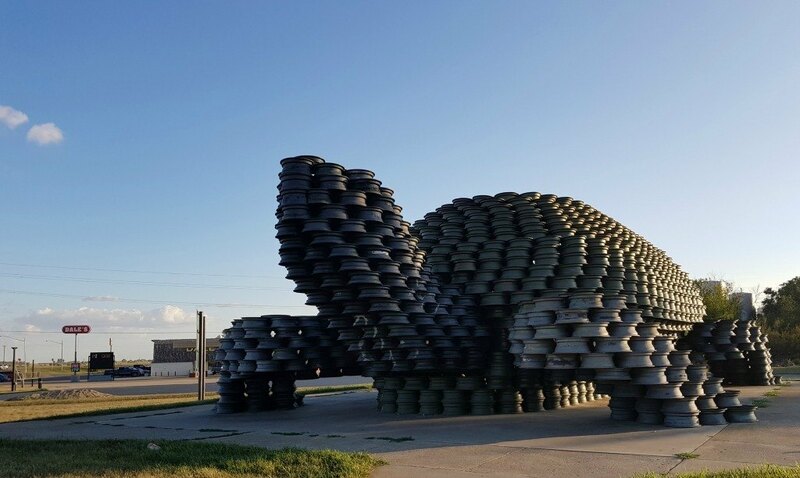 On the way to Rugby, we passed another giant turtle- W’eel Turtle, made of over 2,000 tire rims. It was at this stop that I realized my husband must really love me. He was driving and I had my face in my phone when he exclaimed, “What the heck! Look at that huge turtle!” Of course, he pulled over for me to take 30-minutes’ worth of photos but I very easily could have missed it. What a man does for a woman he loves. We made it to Rugby as the sun began to set. 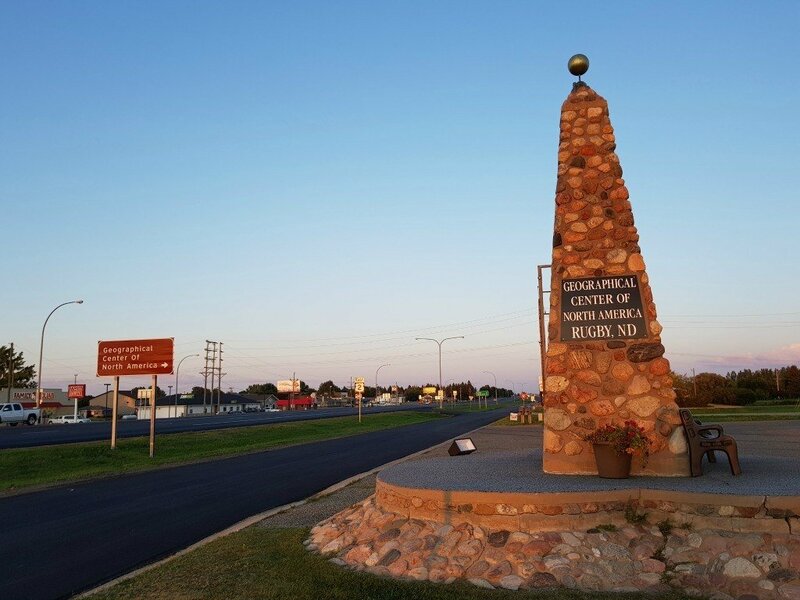 We hastily snapped a few photos at the Geographical Center of North America Monument, though the accuracy of the location is now debated and believed to be in Center, North Dakota, this historic pyramid has welcomed visitors to Rugby since 1932. Right down the road is the Northern Lights Tower, which of course I had to photograph as well. 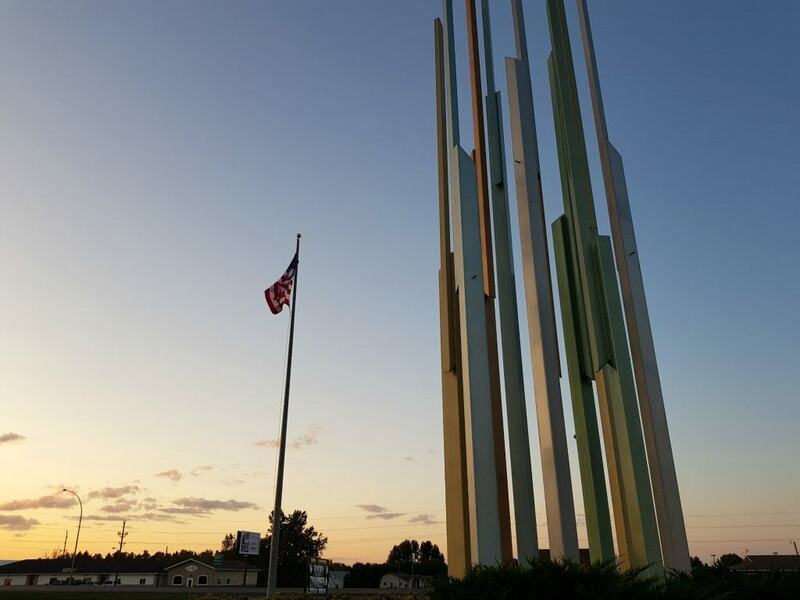 This attraction is fashioned of multi-colored steel beams that light up at night to simulate the Aurora Borealis, which can be seen in North Central North Dakota. We rented a room about 100-feet down the road at the recently opened Cobblestone Inn & Suites. The room was large and comfortable and unlike the previous two mornings, we crawled out of bed in time to enjoy the continental breakfast at the hotel. 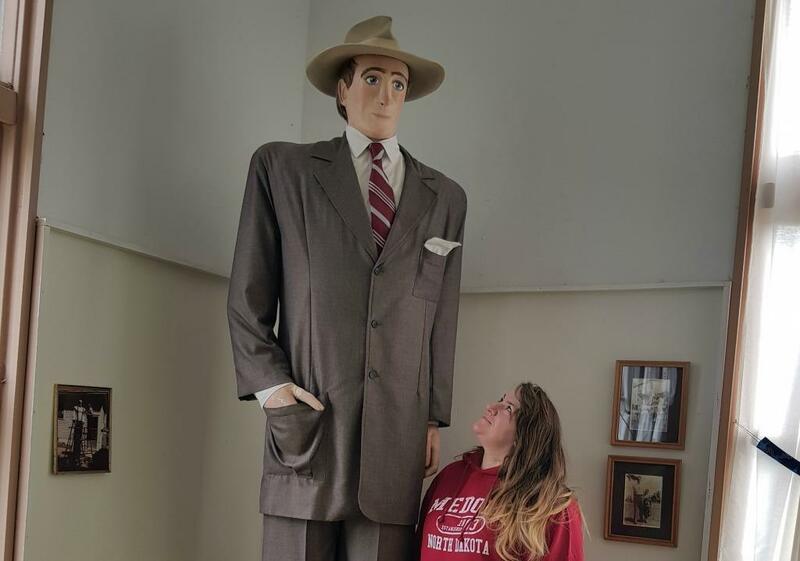 Originally, we had planned to skip the Prairie Village and Museum but as I was researching on my phone, I noticed that the property was in possession of a replica of the world’s tallest man. That sealed the deal for me. We couldn’t leave Rugby without seeing Clifford Thompson, the giant man, and I’m so glad we made the effort. 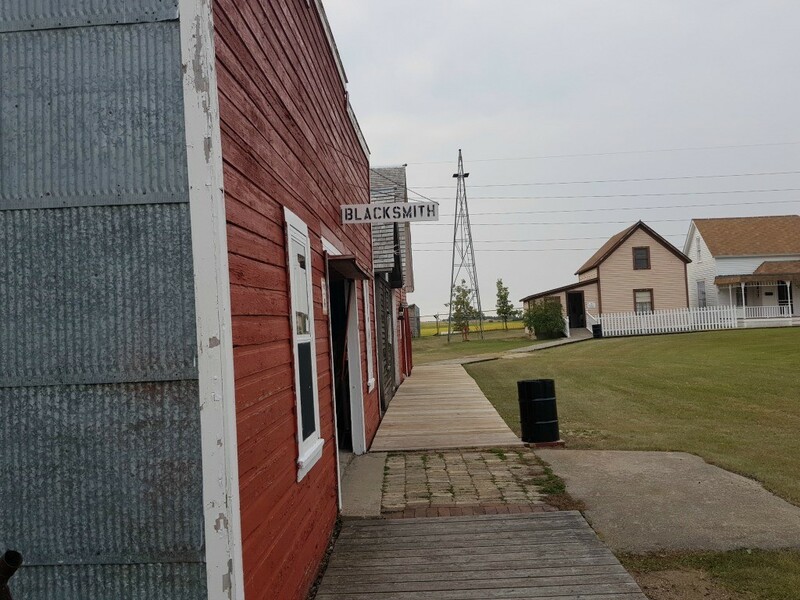 The Prairie Village and Museum impressed both myself and my husband and was one of our favorite stops in North Dakota. As we made our way through each of the 23 buildings in the village, we marveled at the collections on display. 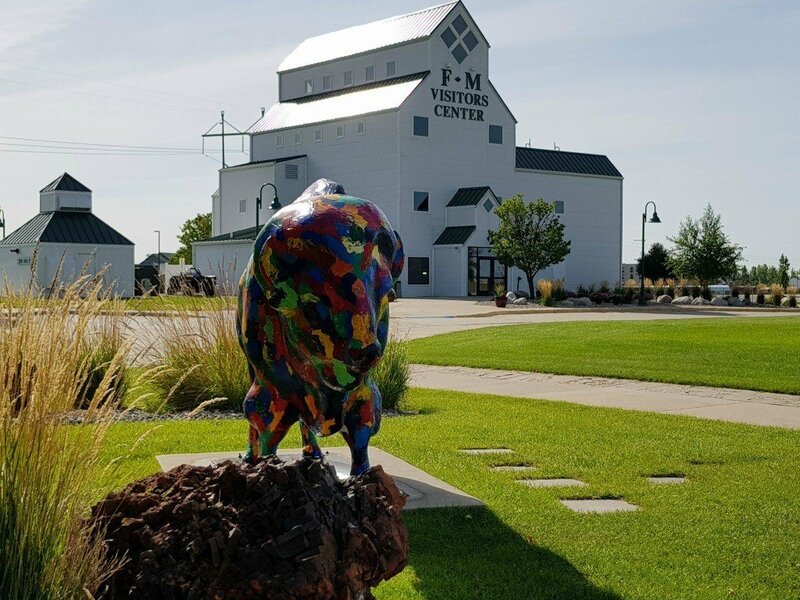 The Prairie Village and Museum is one of the hidden gems in North Dakota. We spent nearly two hours exploring, dragging ourselves away only so we could attempt to follow our remaining schedule. 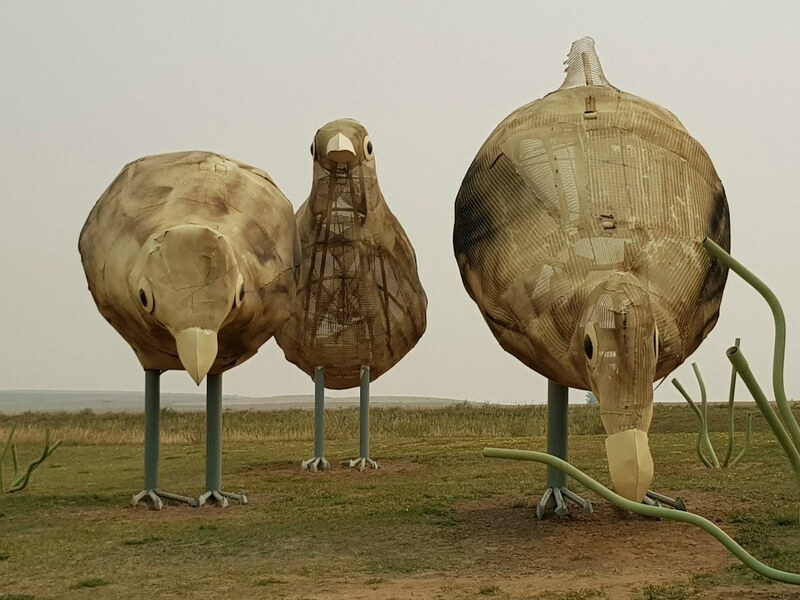 While I couldn’t convince my husband to see all of the roadside attractions in North Dakota, there were some that were hard to resist. The Sandhill Crane in Steele, was one of those. 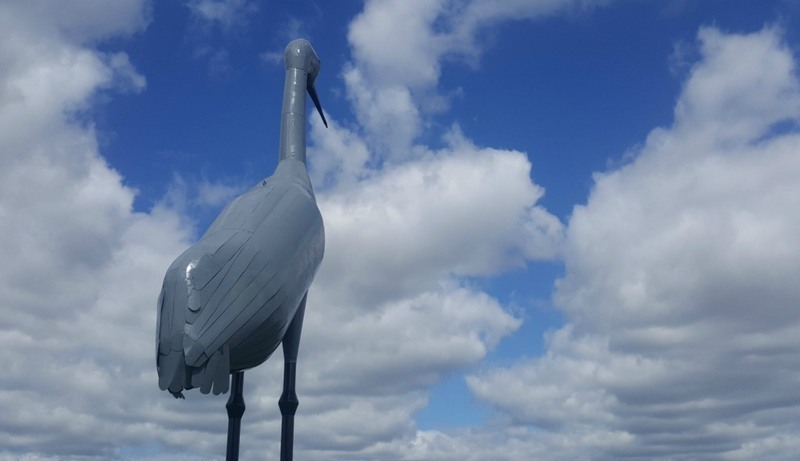 Appropriately named, “Sandy”, this 40-foot-tall sandhill crane is fashioned from metal and sits in a park behind the Cobblestone Inn & Suites a short drive from I-94. Next up, was Jamestown, about 2 hours and 15 minutes away. While I could not wait to see the white buffalo and the world’s largest buffalo statue, our bellies had something else in mind. We stopped at the Depot Café for an appetizer of Cheeseburger Eggrolls that we dipped in a tangy dipping sauce, followed by a sandwich and salad. The World’s Largest Buffalo was constructed in 1959 and is 26-feet-tall and weighs 60 tons! Visitors can look out over the surrounding field at the Sacred White Buffalo Herd to see some of the world’s only albino buffalo. I did see one of the elusive creatures, though I had failed to pack my zoom lens so I could snap a good photo. I shopped for souvenirs in the gift shop at the Frontier Village before reluctantly climbing back in the car for another hour and a half to Fargo, our final stop in North Dakota. We found our room for the night at the Holiday Inn Express. We were given a suite that was massive and gorgeous! It was perfect for our 5th night on the road. The spaciousness allowed me to stay up to the wee hours of the morning getting a few projects done, while my husband slept comfortably across the room on the large King size bed. 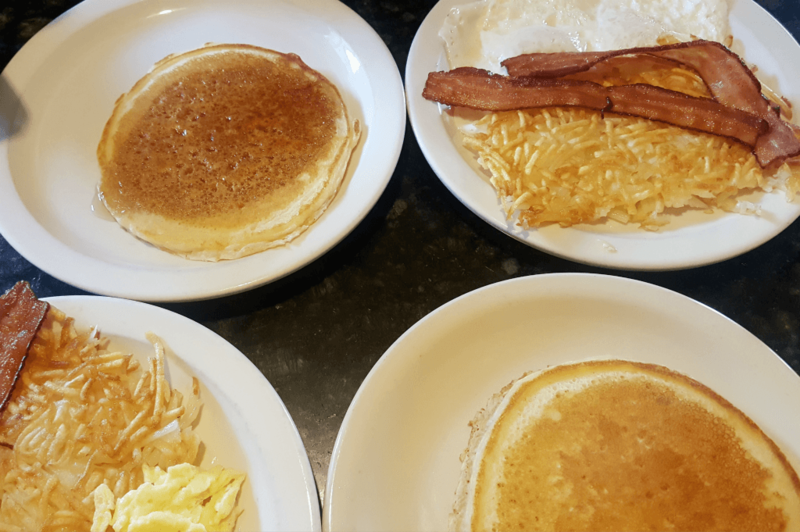 In the morning, we packed up and went in search of the best pancakes in North Dakota. We found them at CJ’s Kitchen. The food was served quickly, and the pancakes may very well have been the best we’ve eaten. By the time we’d finished breakfast, the Fargo-Moorhead Visitor Center had opened, and we stopped in to get a photo with the wood chipper used in the movie, Fargo. My husband could not be convinced to join me, but I took a moment to pose before checking out some of the other movie memorabilia inside. 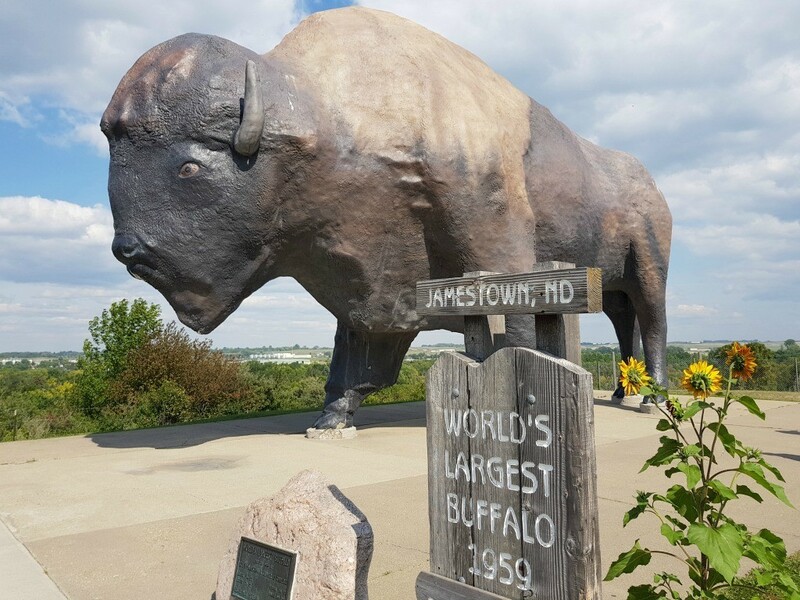 When my curiosity had been satisfied, I made my way outdoors to join my husband and read the names on the walk of fame and take a photo of the painted buffalo- only one of 20 that can be found scattered around the greater Fargo area. I had hopes of finding them all during our visit but that was short lived as my husband insisted that he was ready to begin making our way towards home. 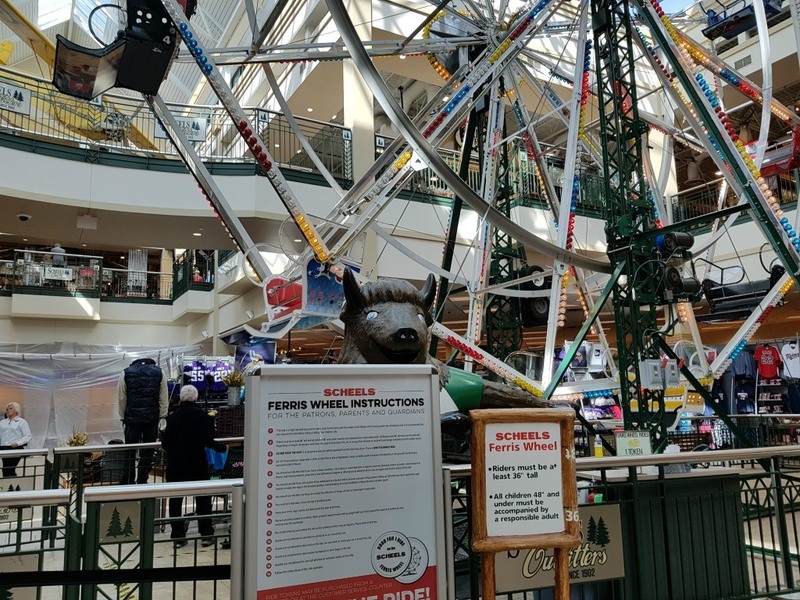 We combined our sightseeing efforts with a shopping venture as we stopped in to Scheels, the world’s largest all sports store and only athletic/outdoors store we’ve been in that houses a full-size Ferris wheel. We threw our purchases in the back of our van and headed downtown to see the Fargo Theatre, which is gorgeous. I wanted to go inside, but my husband had his mind on one thing. Donuts. We were told that Sandy’s Donuts are the best donuts in all of North Dakota. How could we leave without a six-pack of sweetness? 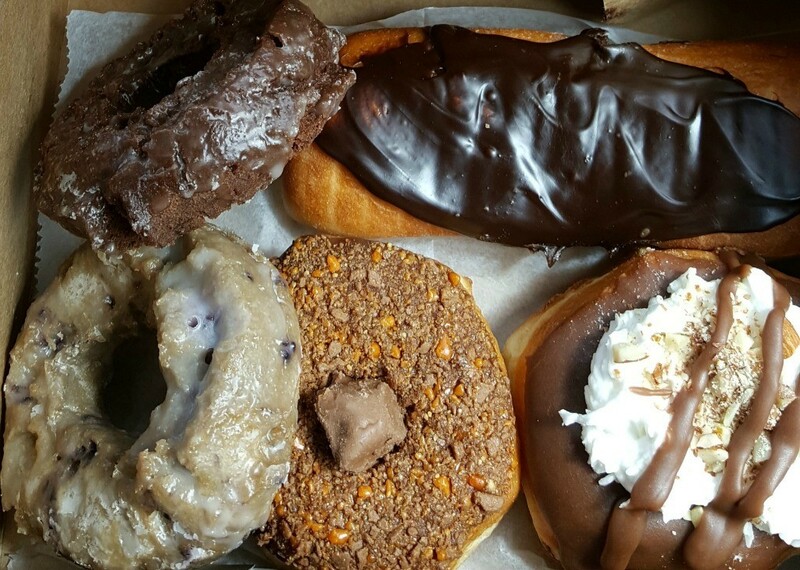 Since we have not had the opportunity to sample donuts from all across North Dakota (why didn’t we think of that sooner? ), we really can’t confer with the comment that they’re the best in the state, but they were pretty tasty. Sadly, our time in North Dakota has drawn to a close. Originally, I thought four days may have been too much time to spend in the state but I realized that we could have spent two weeks and not have seen everything that was on my list. Do you know what that means? It means that I’m already plotting that return trip to North Dakota to see everything on my list. Stay tuned, I’ll have more in depth information on the places we did visit coming up. Plus, you can subscribe to my newsletter so you’ll know when those posts have been written. Visit North Dakota Tourism for more information about visiting North Dakota or order your FREE tourism guides to help you plan your own trip. Have you been to North Dakota? What did you enjoy most about your visit? Thank you to North Dakota Tourism for extending and invitation to visit North Dakota and arranging our schedule. 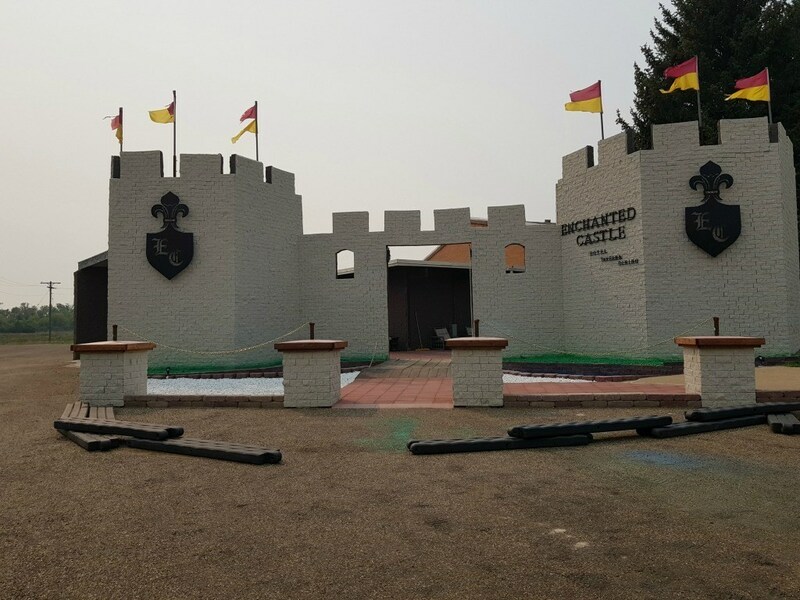 Some of the hotels and activities were paid for by North Dakota Tourism so that we could share our experiences with readers of Travel Inspired Living. Great photos – a lot of people think North Dakota is a barren wasteland. It’s not, and your photos prove it! Thank you, John! I really enjoyed visiting North Dakota. I was surprised by how diverse the landscape is. I hope to get back for another visit some day. Not only am I pinning this so I have it for when road-trip., I’ll share it with my cousin that just moved to Bismark. I didn’t realize there were so much roadside attractions in North Dakota. Fun! The Pitchfork Steak Fondue totally caught my attention! I’d be up for that for sure! The Pitchfork Fondue was wonderful! It’s timed perfectly to enjoy the sun as it starts to set on the Badlands. 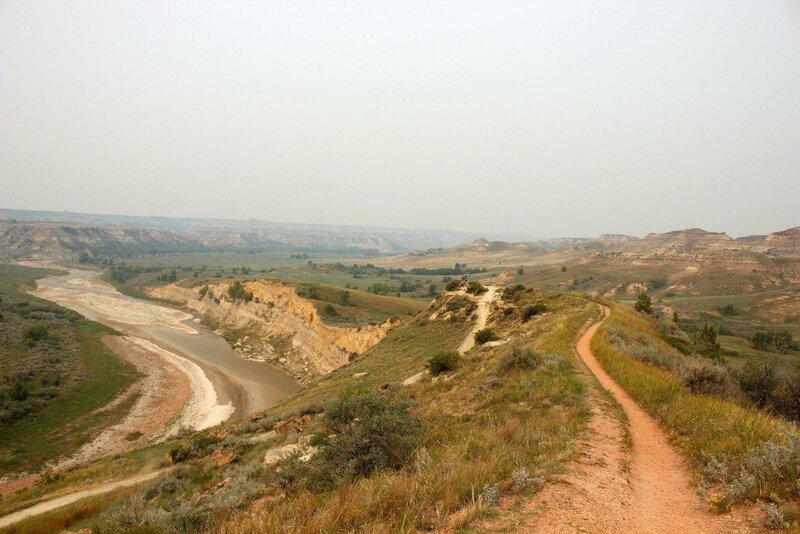 We went to North Dakota because of the Theodore Roosevelt National Park. Just sad we missed that Enchanted Highway! It’s such a fun mini-trip in North Dakota! The drive took us a couple hours because I had to stop and take a ton of photos along the way. I’ll have a post on the Enchanted Highway soon. Wow! I didn’t know there is so much to see and do in North Dakota. Glad you shared all of these. I will put North Dakota on our bucket list. I found so much more while we were there that we didn’t have time for! I really want to plan a trip back. I had the pleasure of driving through North Dakota on my way to Yellowstone and I couldn’t agree more, it’s such a beautiful state. Reading this post brings back so many good memories. There’s so much to do. I think I’m due for a trip back soon! Pinned for future reference, thanks! Ahhhh….Yellowstone….another destination that I need to return to! Maybe I can swing through North Dakota on the way to see all that I missed. 😉 Glad to hear that you enjoyed the state too! North Dakota sounds like a great place to visit. I’ve never heard of a Cheeseburger Eggroll but I like the sound of it. 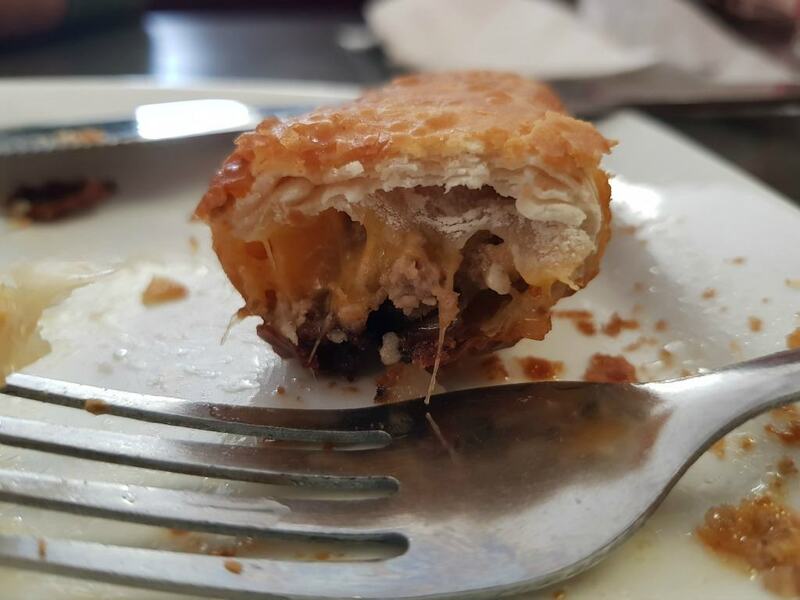 It’s the first Cheeseburger Eggroll I’ve ever heard of too, but I hope it isn’t the last. It was yummy. Gosh such beautiful scenery! And I love all the quirky attractions. Definitely must add North Dakota to my travel bucket list. I know, right?! 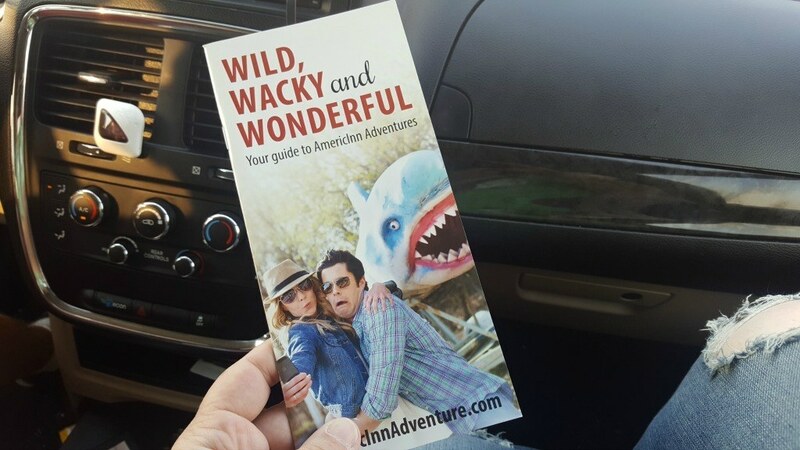 I seek out those quirky attractions wherever I go and if you enjoy them North Dakota is your state to visit! Wow, what a beautiful place. It sounds like I have something to add to my bucket list. This is one of the places we haven’t gotten to visit yet. It seems to be often overlooked but I have no idea why! It’s gorgeous! North Dakota is so beautiful! It is one our bucket list of places to see this year. we have family to stay with and we can’t wait to see some of these places! I haven’t been to the Dakotas since I was very little. I would love to visit again sometime since I can’t even remember it. I know they have such beautiful scenery too. That sounds like a wonderful time! I would love to visit there! Sounds like there is no shortage of things to see and do! I would love to take a road trip out this way and check out North Dakota. Nice when there are so many sights and activities to stay busy. Looks like you had a blast! There are so many things that we didn’t get to on this trip. I need to plan a longer trip next time. 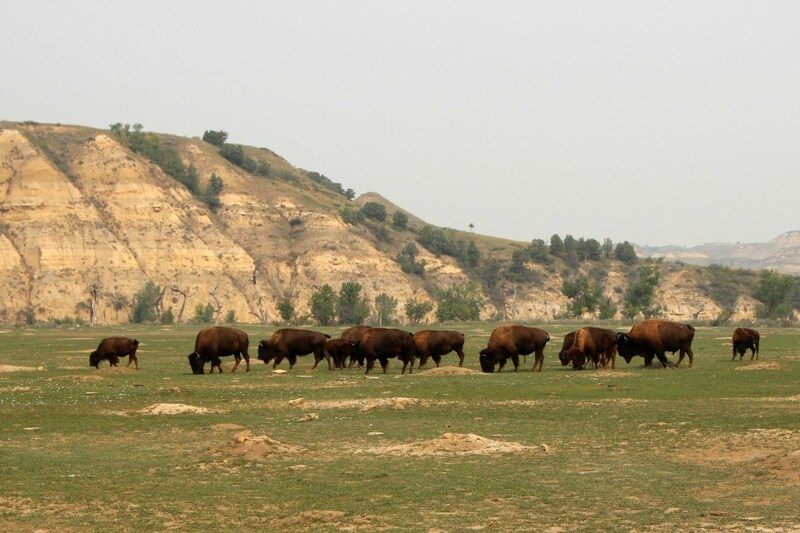 My husband would love to go back and spend several days just in Medora. It looks like there’s a lot in store for you when you visit North Dakota! Thanks for sharing the places that you went to. I would love to go explore the place someday soon! That pitch fork dinner would make my oldest three very happy. My in-laws went to North Dakota and they loved it too. I’ve never been to North Dakota before, but I would love to travel there someday. Looks like a beautiful state. I will be honest I never before had an itch to visit N.Dakota ever. 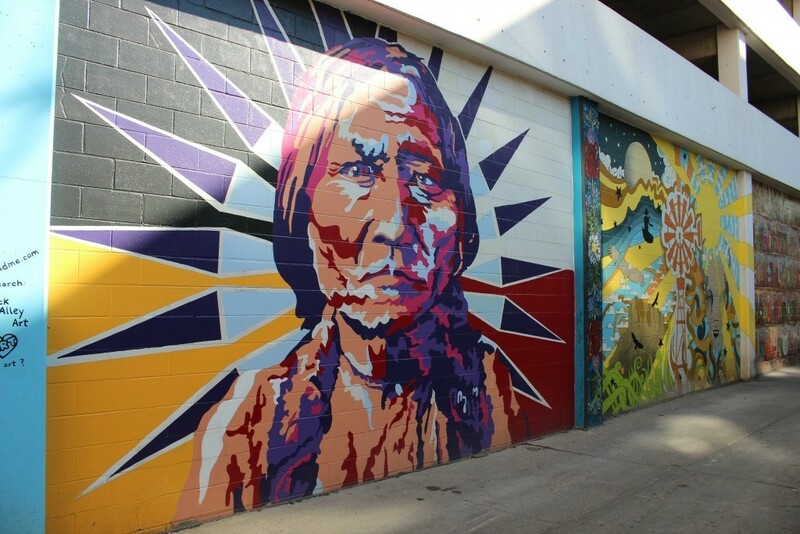 Art Alley is amazing, especially with the big mural of an indigenous chief! Those statues look like they are all trying to outdo each other as the biggest and largest. I think this will be the most exciting road trip I would ever make, with all those attractions to see. The big open spaces feel right to me. I haven’t been to North Dakota, but it feels like a place I’d be at home in. So much to see and do, and all that gorgeous scenery! Your photos are amazing! I had no idea North Dakota has a lot of great attractions like these! Must visit! Amazing! I had never thought of visiting North Dakota, but now I’m convinced! Looks beautiful! You caught some gorgeous photos and it looks like you had a wonderful time! I’ve only ever driven through but it’s always nice! The Enchanted Highway looks so fun to visit. My husband has been wanting to visit North Dakota some day. Your photos are amazing, I feel like I’ve been there! I’d love to go to North Dakota one day! North Dakota looks like a great place to visit. I would love to check out the Enchanted Castle. It looks like a fun place to stay. Looks like North Dakota has a lot to offer the traveler there. I am glad you were able to experience this and share some amazing photos. I am inspired to go visit! I had no idea there was so much to see and do in North Dakota. I would love to see the Crane and the Buffalo. My husband and I got to explore North Dakota, and we have seen a lot of these places. We loved the largest dairy cow ha ha. I am bummed that we didn’t eat a the Pitchfork Steak fondue. That looks amazing! North Dakota really is a great state! What a helpful guide! Thanks for all the details. I’ll refer to your info for sure when planning a future trip! What a wonderful trip to North Dakota. I have to admit that I’m blown away by the food. Steak on a pitchfork? Sign me up! It sounds like you had a great time! There are so many attractions to see and experiences while you’re there. I love that you got to spend more time in each, that makes you appreciate the trip more. I never would have guessed that North Dakota would have so much amazing things to check out! Thanks for sharing this, I think I have to add to my bucket list. North Dakota looks absolutely gorgeous! I’ve never been. Though next up on my list is South Dakota because a good friend of mine moved there and I want to visit. This really did sound like a good time. I love the idea of the Pitchfork Steak Fondue and The National Park would be really nice to check out in person. I’ve never been to North Dakota before, but this definitely looks like a great place to visit. There is a lot to do and the scenery is beautiful! North Dakota sounds like such a wonderful state to visit. I love the natural beauty of it. It’s one of those places that really brings home just what mother nature can do in the world. I didn’t realize there was so much to do in North Dakota! I have been to South Dakota – and used to live in Minnesota. I’ve always wanted to visit North Dakota. I’m a huge fan of westerns, and I’ve always dreamed of seeing the terrain of my favorite movie genre. North Dakota sounds like a great place to visit. We’ve been trying to get to North Dakota, but we haven’t been able to yet. I really, really want to get there, though. That sounds like a cool place to visit. I had never really thought of going to either of the Dakotas before, but this sounds fun!